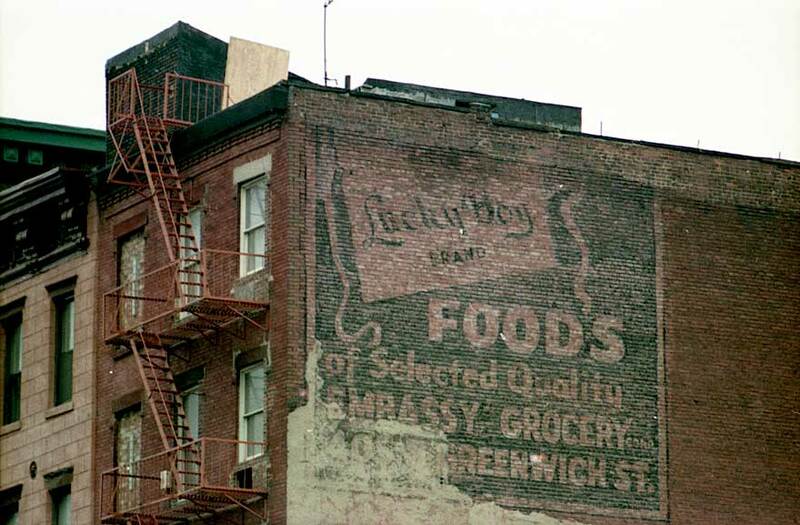 Lucky Boy was the trademark for numerous products distributed by the Embassy Grocery Corp. who were located here on Greenwich St. from 1936 to 1963. Embassy began in business around 1927, and they were listed in the Manhattan telephone directory from 1928 to 1986. In their later years (1964 to 1986) their address was 57-10 49th St., Maspeth, Queens, NY. food colors for domestic use; cleaning supplies, namely, cleansers, polishes, aerosol spray cleansers and polishes, and floor wax. There were also canned goods, namely, fruits, vegetables, fish and meats; salad dressing; soups; jams and jellies; pickles; oils and shortening; cheese; salad mixes, namely, dehydrated mixes for forming meat, chicken, egg or fish salad, and chicken, tuna or ham salad; fruit pie fillings; milk; shredded or flaked cocoanut, and minced meat; processed nuts and olives. There also were desserts, namely, gelatin dessert, pudding and tapioca; cookies and cakes; seasonings; flavor extracts; coffee, tea and tea bags; gravy; sauces, namely, barbecue, bercy bordelaise, cream, hollandaise, wine, hot, soy and worcester sauces; breakfast cereal; flour; honey; macaroni and noodles; relishes; rice; spices; mints; capers; marshmallows; candy; baking supplies, namely, arrowroot, baking powder, chocolate, sprinkles, icing, meringue mix topping; unprocessed nuts and olives. Also registered were fountain and bar supplies, namely, lemon crystals, powders and syrups for making beverages, syrups and toppings; fruit and vegetable juices and concentrate. Later registrations included powdered milk and eggnog; dairy products, excluding ice cream, milk and frozen yogurt; salad dressing, fruit fillings for pies. Also there were cookies and cakes; bakery supplies, namely lecithin in aerosol cans for use in baking, baking chocolate, cocoa, chocolate sprinkles and icing; coffee and tea; breakfast cereal; flour; honey; macaroni and noodle products, namely macaroni, noodles and pasta; spices, seasonings, relish and mustard; rice; mints; capers; marshmallows; petit fours. Also, non alcoholic cranberry juice cocktail containing water, fruit juice, tomato juice, fruit nectars and concentrates for making fruit drinks. One of the officers in Embassy Grocery Corp. was Samuel Wirfel (1891-1953). His obituary in the New York Times, 14 Dec. 1953, p. 31, read, "Samuel Wirfel, co-founder and vice president of the Embassy Grocery Corporation, 407 Greenwich Street, institutional wholesale grocers, died yesterday in Adelphi Hospital, Brooklyn, after suffering a heart attack on the way to his home at 1055 Walton Avenue, the Bronx. His age was 64. He leaves his wife, Mrs. Ida Newman Wirfel; a son, Arnold; a daughter, Mrs. Beatrice Elstein, and four sisters." Another founder was Samuel J. Fixler (1892-1980). His death notice in the New York Times, 6 July 1980, read, "Fixler - Samuel J., of Miami Beach since 1974, from New York City. One of the founders and Treasurer of Embassy Produce Corp. Beloved husband of Lena, devoted father of Robert and Arthur of New York City, Margaret Mason of New York City and Thelma Weingarten of Fort Lauderdale…"
Both Wirfel and Fixler registered for the World War I draft in 1917 prior to the formation of Embassy Grocery Corp. In 1917 Samuel Wirfel was 27 years old, born Sept. 1891, Galicia, Austria, and in business for himself at 227 W. 27th St., Manhattan. Fixler was 25 years old, born 24 May 1892, New York City, and a produce dealer in business for himself at 653 Cauldwell Ave., the Bronx. Both men also registered for the draft in 1942. At that time both were employed at Embassy Grocery Corp. on Greenwich St. Fixler was 50 years old, born 24 May 1892, New York City. He lived at 1505 Townsend Ave., the Bronx. Wirfel was 51 years old, born 10 Nov. 1890, Galicia, Poland. He lived at 1055 Walton Ave., the Bronx.